This article shows just how easy it is to make an inexpensive low VSWR load for antenna analyser validation / measurements. 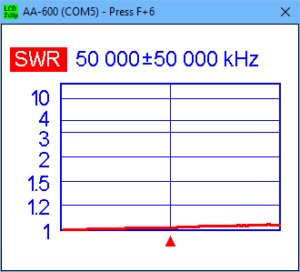 Above is an AA-600 sweep of the prototype from 10kHz to 100MHz. 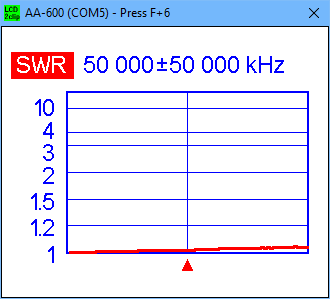 VSWR reads 1.02 in ‘All’ mode at 100MHz… better than the inherent accuracy of the instrument. It is made from two 100Ω 1% 1206 SM resistors purchased on eBay for about $2/100, so about $0.04 for the resistors, and 40mm of bare copper wire (0.5mm phone / data wire in this case). 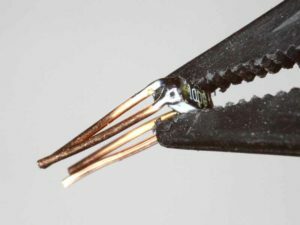 In use, it is held in contact with the coax socket (in this case an N type) with a pair of disposable plastic first aid tweezers (yep, you can buy them on ebay for about $0.20/pair). While you are at it, make a good short circuit termination by scrunching up a bit of (clean) kitchen aluminium foil and press that against the coax socket conductors. Try both of these on your antenna analyser and see how it stacks up.